Perhaps, most of the people opt for sports not only for a solid recreational purpose. Sports activity helps you to maintain good health and mind. Simultaneously, it helps you to lose your weight and gaining a perfect BMI. Nowadays human being becomes passionless and mechanical. We are too busy with our works and jobs. Even We have not enough time to walk. If you observe your surroundings, you will find a lot of people who are not serious about their minimum exercise. Their physical activity is nil. For this kind of people, outdoor sports activity is the best alternative to workout. Like all the outdoor sports, Longboarding is a familiar sports activity, especially for young people. Longboarding has become a trendy sport and talk of the town because of its adventure’s feelings. It provides various health benefits to the doors. Almost every longboarder consider longboarding as a part of their daily workout along with the fun. Each and every limb of your body becomes agitated during Longboarding. So, ultimately your body gets a positive impact. In this article, we will show you the weight loss effect along with the health benefits of longboarding. No more ado lets dig out the points. Well, weight loss does not depend on exercise only. Weight loss is a running process and Exercise is an important part of the process. There is no doubt that longboarding is a popular way of exercise having fun. By one-hour longboarding, you will lose 300 calories in a 125-pound person. So, if you have a strong intention to lose weight you have to focus on your diet plan also. The motto of a great diet is to “Eat healthily and live well”. A healthy diet contains the least number of calories according to your BMI. To understand the metabolism rate is an important aspect regarding weight loss. Metabolism rate becomes slow with the increase of age. Same meal for a teenager who is 15 years old and a young man who is 26 years old, absolutely, differs a lot. When you are a teenager, your metabolism rate was high so that the extra meal had less effect on your health. But, for 26 years, the young man has more effect on an extra meal due to the metabolism rate of the body. If you do not follow a proper workout, your extra body nutrition like fat, carbohydrate, and protein make you fatty. Weight loss is just a single factor of many to achieve good health. Overweight is not always bad for health. But it varies from person to person. Suppose, for an athlete needs high weight to gain muscle. But an ordinary people who do not follow any workout, indeed, overweight is dangerous for him. So, if you afford to use the extra weight to gain muscle through longboarding it is all correct. Simultaneously with a control diet longboarding will help you to lose weight also. Besides weight loss longboarding has some great benefits for health. Cardio is a special type of exercise that increases your heart rate and heart pumping. When you are on the Longboard the movement makes the heart rate faster. Cardio has a direct impact on weight loss. Your cardiovascular system becomes strong while you take the cardio. As the heartbeat becomes faster, the rate of blood circulation increases. Ultimately, your health produces more oxygen in blood and muscle that has a positive impact on weight loss. So, regular Longboarding makes your heart, immune system and lung stronger than before. Longboarding helps you to strengthen your whole-body muscle. Consider your leg first. You have to use both legs to run the board. you need to push yourself with one leg and balance with another leg. Once you start the boards with paddle ultimately you start firing on your muscle fibers. It helps to strengthen your body and muscle indeed. Longboarding burns more or less 4 to 7 calories per minute, ultimately reducing the fat of your whole body. Aside from being effective cardio and strength exercise, longboarding allows you great body flexibility. If you stiff your muscle during longboarding it will be harder and inflexible to control over the boards. So, when you are on the board regularly, naturally your body becomes flexible. And body flexibility is much-needed criteria to become a good longboarding player. the more effort you put into the longboards the more energy you spend. But in return, your stamina and energy will increase. So, the faster you skate, the faster your body consume the amount the energy. So, longboarding Is appropriate for the people who want to maintain their body and reduce the weight by vigorous movement and stunt. Longboarding is a good way to achieve and maintain physical fitness indeed. Among all the convenience of longboarding, you can perform it according to your flexible time zone. So, there is no time constraint for you. A regular basis skating makes your muscle stronger and more flexible. Regular basis longboarding improves your health as well as immune system and reduces the chance of cardiac arrest, stroke, high blood pressure, and other chronic diseases. For the beginner, it is better to start longboarding under intensive supervision of experienced players or an instructor or a trainer. To performing burnouts, the rough and hilly area is the best. And it is more effective to lose weight, gain muscle and flexibility of the body. It boosts the burning of calories and makes it at least double. You will see a visible result within a short period. Though it is one kind of sports for recreational and exercise purpose, you should use the safety kits like the helmet, knee pad, elbow pad etc. We recommend longboarding as a great exercise purpose. But a newbie you should consult an experienced trainer and enhance your skill fast. Then go for the harder styles and tricks. To get rapid result consistency is an important issue. 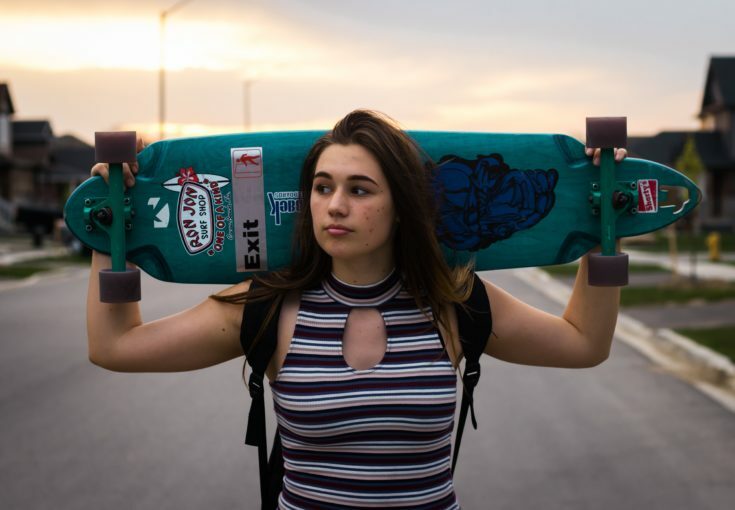 If you want to know other health benefits and usefulness of longboarding just skim through our other articles naming health benefits of longboarding, benefits of having a longboard, why should you go for a longboard immediately?